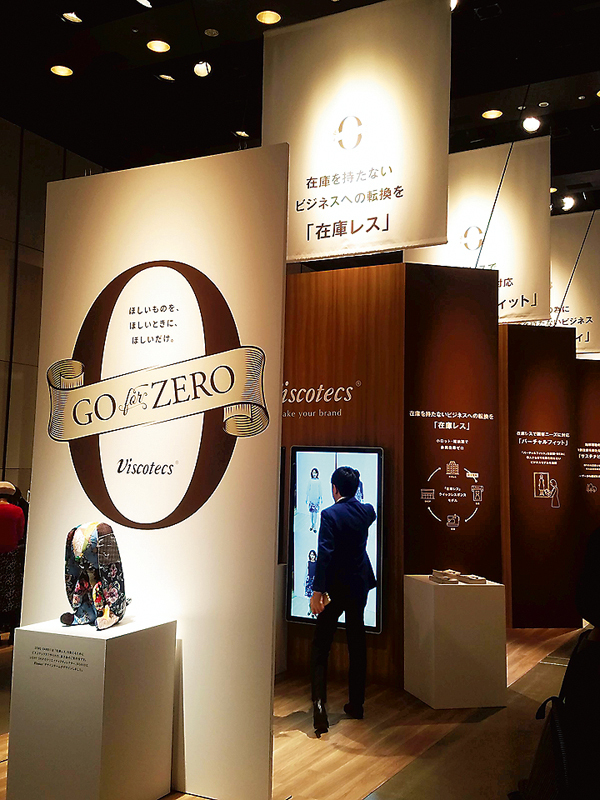 Starting from the 2019 Autumn/Winter season, Seiren is supporting initiatives throughout the apparel industry to reduce excessive inventory utilising its in-house personal order brand, Viscotecs, make your brand (MYB). The Viscotecs digital production system offers the ability to produce orders for a range of products in small lots and with short lead times, reducing the need for excessive inventory. The Viscotecs system also contributes to corporate environmental initiatives. MYB was launched as a BtoC (business to consumer) service in 2015, utilising the Viscotecs system. MYB allows customers to create “a style just for them,” by choosing their preferred silhouette, colour, pattern and size using a tablet or smartphone either in retail stores or through EC retailers. MYB offers a personal fit to customers based on a full-body photo they have taken in a retail shop. The customer’s order data is transferred to Seiren’s CAD/CAM (computer-aided design and computer-aided manufacturing) system at its dedicated factory in Fukui Prefecture, and the clothing is manufactured by making use of an ink-jet printer. Seiren will now take the BtoC production know-how it has built up through MYB to launch its new BtoB (business to business) venture. In addition to enabling inventory-free operations, it also allows businesses to simulate their designs on a monitor, reducing the labour associated with sample production, thus, “contributing to energy and resource use reductions,” according to Seiren. Currently MYB only offers one-piece dresses, but the product line-up can be expected to expand as the need arises. Seiren will seek further differentiation by combining its proprietary materials with Viscotecs technology. The technology has now improved to such a degree that fabrics appear to be pre-dyed rather than dyed at production time. It has also used Viscotecs to process its Quore material, a synthetic leather used primarily in automobile interiors, for handbags, and double raschel mesh. Seiren is leveraging the water-resistant properties and breathability of Quore and promoting its use in coats. Through continuous improvements, Seiren was able to reduce the weight of the material to 220 – 230 grams to create a high-quality, lightweight, and functional material sample ideal for use in outer wear.